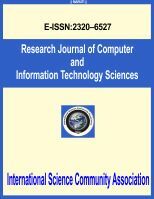 International Science Community Association are publishing an international peer reviewed journal Research Journal of Computer and Information Technology Sciences. It is the vision of International Science Community Association to publish research papers, research articles, review papers, mini review, case study and short commutations in all areas of human study without financial restriction. Coverage Area: Researches in the field of Computer and Information Technology Sciences including computer architecture, computer graphics and visualizations, software engineering, algorithms, programming languages, operating systems, computer networks, operations research, game and multimedia systems, embedded system, security systems, web and wireless technologies, web designing and internet computing systems, future internet architecture, protocols and services, theoretical computer science, compiler design, database theory and practice, green networking, networking and communications systems, information and database systems, optical networks, bioinformatics, geographical information systems/ global navigation satellite systems (GIS/GNSS), intelligent VLSI, robotics, mobile and ubiquitous computing, mobile computing for e-commerce and recent trends in advanced Information technology, etc.